Nigiri Set (RM22/USD6.90) – 5 pieces of Nigiri Sushi & 1 Hoso Maki served on the geta, a wooden clog-like tray used to present the sushi. And so, there we were on a hot afternoon, seeking for a pleasurable session of lunch with the colleagues somewhere in Ipoh Garden East. If you remember my post last week, the Domino’s Pizza plan went awry when the pizzeria was packed during lunch, and we ended up at Mokuren instead. 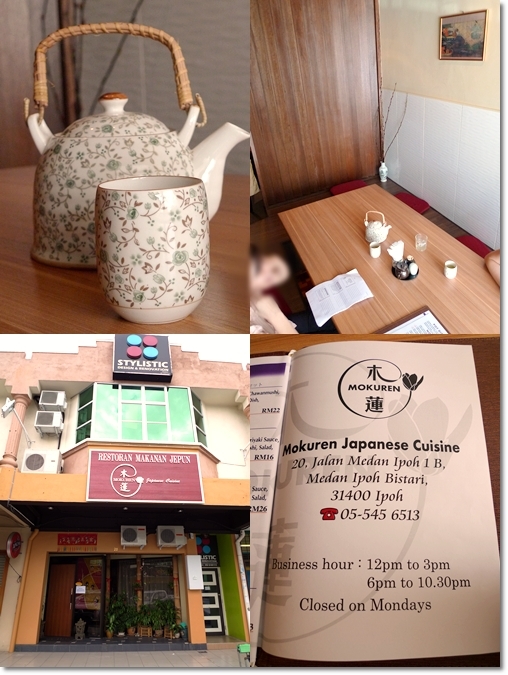 Mokuren is a new Japanese restaurant at Medan Ipoh Bistari; situated on the same row with Kizuna. 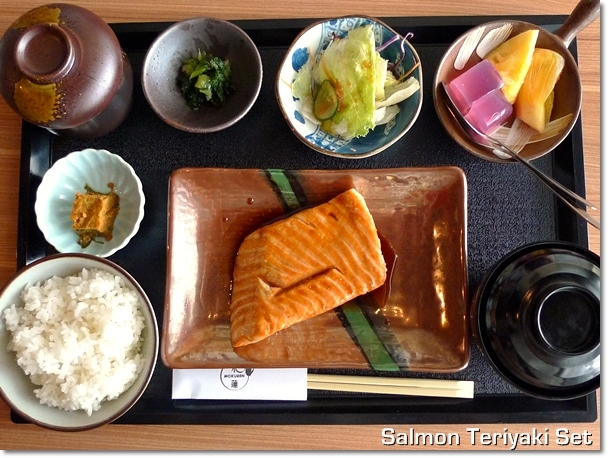 Salmon Teriyaki Set (RM18/USD5.60) – A thick slab of salmon grilled with teriyaki sauce, and served with white rice, miso soup, chawan mushi and the other side dishes. The couple met in Prague, and had this vision of opening a Japanese restaurant. Then they came back to Ipoh, and found this space to put their desires into work; realizing their shared dream. Mokuren was thus the fruit of their labour, and the rest was will soon be history in the compendium of fine Japanese cuisine in good old Ipoh …. Imagine the quantity of Omega-3 Oil from that one-inch thick slab of salmon cut, grilled to perfection then basked in a sweetish teriyaki sauce !!! Stepping into the restaurant, one can’t help but get this cozy feeling of eating in a homely environment. Much like Tengood in Greentown, but on a somewhat different scale, Tengood emulates the ambience and cuisine of an ‘izakaya’ (Japanese style of watering hole with light bites) more than a full-fledged restaurant. The menu covers not the entire slew of Japanese food, but includes an array of interesting additions not generically found in the other Japanese restaurants in Ipoh. Since this was our initial visit to Moruken, we proceeded to play safe and took the simpler (and much more economical) route of trying the Lunch Sets (available from 12.00pm – 2.30pm) instead of going ala carte. Nine sets are available on the menu, priced from RM16 – RM26 (USD5 – USD8) each. From the usual suspects like Salmon/Chicken/Gindara (Cod fish) Teriyaki, to Mini versions of the Seafood Teppan Yaki, Nabeyaki Udon and Unagi Bento Set. 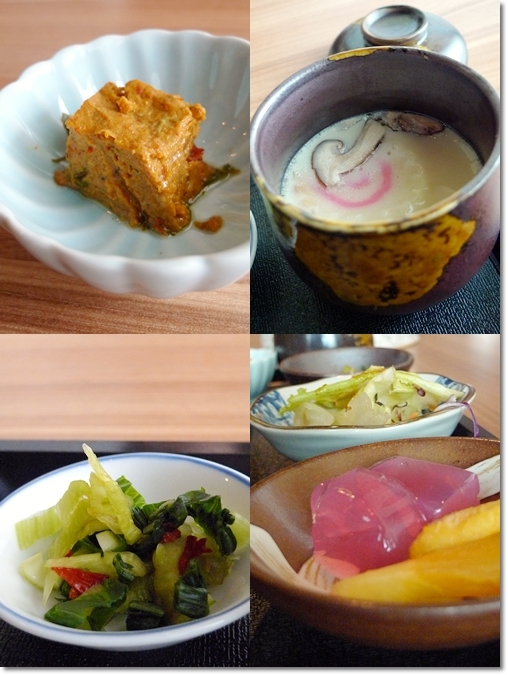 The Side Dishes – Clockwise from top left : A cube of fish (?) paste that tasted like our local ‘otak-otak’ minus the spiciness, a serving of steamed egg (Chawan mushi), desserts of jelly and fresh fruits, and a plate of pickled vegetables with red chillies. Among all the sets we ordered, the Nigiri Set (RM22/USD6.90) tipped the scale of satisfaction with generous portions of nigiri sushi – Salmon, Maguro (tuna), Hamachi (yellowtail), Shrimp (ebi), and one other I could not remember (the last one in the pic), but looks uncannily like crab stick. The thin roll of salmon hoso maki was embed with ample bite-size cubes of salmon as well. Not only that, the set also came with a bowl of mini udon (sadly nothing memorable), a serving of chawan mushi (Japanese style of savoury steamed egg custard), and the other sides as depicted in the picture above. The pickles and that mysterious cube of slightly spicy fish paste (really tasted like otak-otak) screamed unconventional; though I can’t really put my hand on their respective identities. 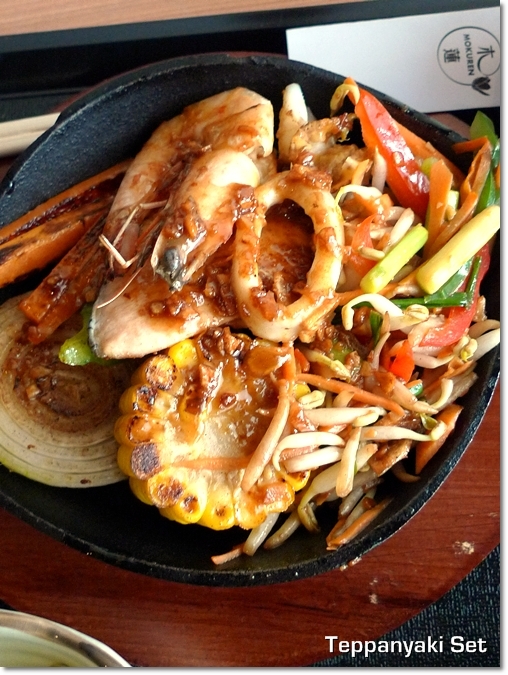 Mini Seafood Teppanyaki Set (RM23/USD7.20) – Pan-grilled prawns, squids, and fish with a mix of vegetables, and the usual sides. 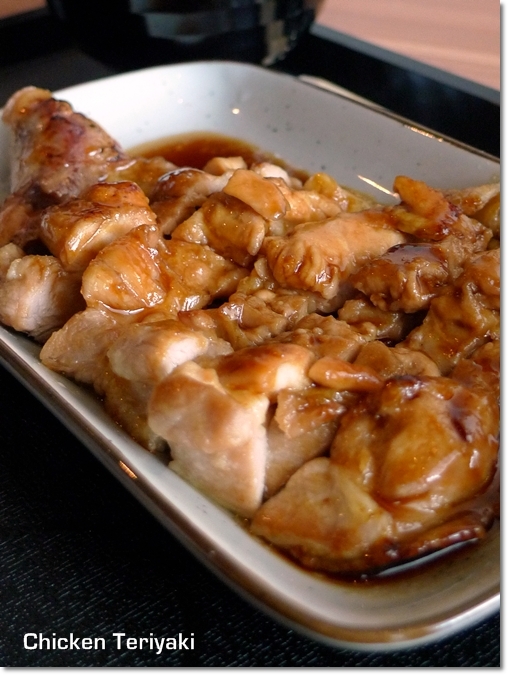 The Chicken Teriyaki was tasty, but too much of chicken skin rendered the experience slightly too greasy. But ample portion for one, that’s for sure. 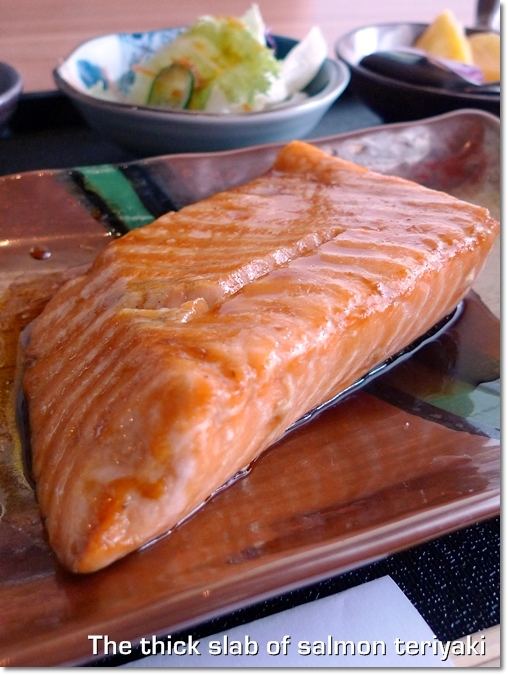 And the Salmon Teriyaki arrived in an amazingly thick cut; something the average Japanese restaurants shy away from. But then again …. the second helping (one of us was late for lunch) proved that our joy was short-lived. His salmon was about half the size of KCA’s. The Teppanyaki Set came loaded on a mini hot plate, still sizzling with a large cut of caramelized onions, grilled corn, and mixed vegetables. In a matter of minutes, the place was more than half-occupied. There is also a sushi bar behind of the waitress in red, and another section with a pseudo-tatami setting (seated on the floor but legs still under the table) that can seat about 8-10 pax. While it is still too early to pass judgment based on one single dining experience, we unanimously agreed that the lunch was above average; especially when it comes to the thick cuts of fresh fishes for the sushi, and the daring venture to include many unrecognizable authentic Japanese items in the menu. And bear in mind that they charge a nett price based on what they printed on the menus; meaning NO government tax and NO service charge. Parking’s not much of a hassle since it is FOC and there are ample parking spaces in front of the shops. *By the way, Mokuren (or Magnolia) is a type of flower. *Same row with Kizuna Japanese Restaurant, opposite of Ko Pi Tim coffee shop, and same side with Michelangelo’s Pizzeria and Fu Tien Vegetarian Restaurant. ** Read All About Ipoh’s review HERE. Too much chicken eh? Seldom I heard of people complaining of too much! But I do get what you mean.. and I guess they have to work on their quality control, or rather, size control for their salmon yes? Haha … not too much, but definitely ample portion for one despite the tag “value lunch sets” …. shaz – The restaurant is PORK-free. Not halal. Kind of hard to get Halal status for Japanese restaurants, from what I understood. Since the seafood are sourced from overseas, and some outlets serve sake, a type of rice wine. sekarang banyak restaurant jepun kat ipoh! Good lah for ipoh, means business and times are getting better. The Japanese occupation all over again ! But in a positive light? Haha …. not that I am complaining. Gives us more choices to pick from. Eh … no illusion lah, really really that thick. We were surprised also. many japanese restaurants in Ipoh nowadays, but only handful are of good quality huh!!! too bad!!! Which one is your personal fav, Simple Girl? Akamomiji? But of course, there are various others I have yet to visit, or visited but have not done a review yet. Compare everything in one post? Maybe …. if I have dined several times at the same place, then that’s possible. Hard to judge an outlet unless I am a repeat customer right? Nowadays v hardly get generous slabs of salmon – u jus dun get t uump n satisfaction in others restaurants – but not here !! Simply ichibannnnnn liao !!! She used to work for another Japanese restaurant somewhere around the vicinity. looks like u dont have to go all the way to KL for jap at this rate! Whoa, another one? Has there more Japs staying in Ipoh now? The salmon is huge or ur photo is deceiving? Not deceiving. Haha, no matter how macro I could go, the slab of salmon was indeed thick. Hmm… I thought I did pass by this shop on my way out from that area. Frankly speaking, the sets did not look that impressive to me. I could be wrong with the presentation as well as the gravy/topping that I can see from your photos. By the way, the serving of the “otak-otak” looked so weird for a Japanese set meal and the side dishes appeared to be rather localized. 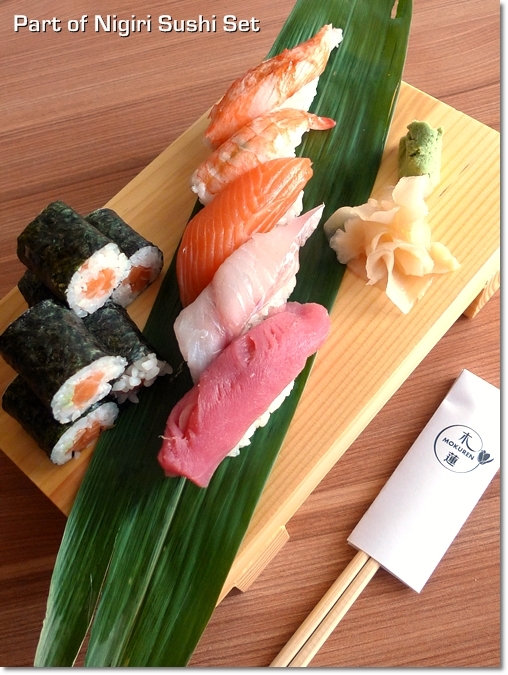 From the look of the Nigiri Sushi Set, the last one looked like artificial frozen prawn as those you get from Seapack. Since when a Japanese restaurant uses that for sushi.. LOL! I don’t think so, Criz. For Mokuren is rather new, opened not too long ago. And this is at another row of shop, not on the same road as the Peking Pan Mee you patronized. However, we did find it strange that the cube of otak-otak like side dish was served, although forgive me people if that’s a delicacy in whichever part of Japan. Bravo ! a new place to go for JAPANESE FOOD !!!! I went to this restaurant last Sunday with my family. We enjoyed our meal. My grandmother who is not a big fan of japanese cuisine also enjoy the grilled unagi and sushi. I personally love the tuna belly don with half boiled egg. Our family go for the ala carte. Huge grilled salmon head for only RM 15 and oysters! My mom was impressed with topping of the green tea ice-cream—> the sesame biscuit, which the chef baked by himself. She said it tasted just the same as the one in Kampachi, Equatorial KL. Yup, and good to know that the staff and the lady boss herself, the petite and warm Japanese lady, were very friendly and accommodated to our needs without being too intrusive. Kudos for that, as I do not want to frantically wave for a green tea refill, nor wanting a personal bodyguard stuck to the edge of our table. Visit the place this saturday and not impressive me. Waited more than 15 minutes for an order. We ordered some handroll, sushi, sashimi, soup noddles, tenpanyaki, rice. And later, the waitress came to us and tell us their soup sold out, rice sold out. They should have communicate well before taking order. Oh, and the hot water also cannot fill for us at the moment, it’s still boiling. So, after waited 30 minutes, our dishes came, the sashimi is good but not great. The sushi are terrible, i think they doesn’t use the japan rice but normal rice and is not stick together. Once you grab it, it torn into pieces. Afterall, i like the mushroom tenpanyaki but still its just an ordinary dish. Thanks Polo for sharing that dining experience with the rest of the readers. Was the place crowded? 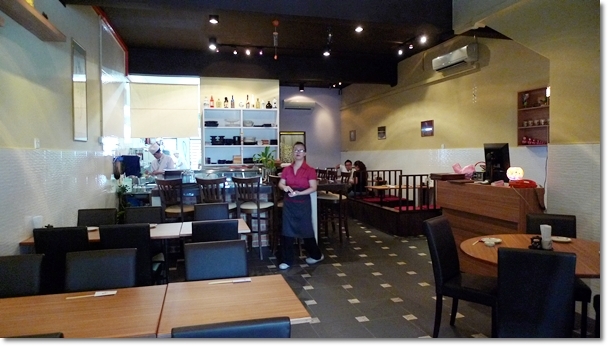 Maybe when we were there, the place was half-empty, hence service was prompt, attentive and not intrusive. We felt comfortable having our lunch there. Though that was my only visit to Mokuren until now. Let’s hope that they take note of the shortcomings and feedback from the diners, to avoid risking losing out to the increasingly tough Japanese food scene in Ipoh. Thanks Polo for sharing your experience in Mokuren. your comments is important for Mokuren to improve for its business growth. Mokuren will take note of your comments and hope will not disapoint your future visit. Do give them so time to improve as the team still consider new and may shorthanded sometime and new in doing own biz and trying to improve from time to time form the comments/feedback from the customers. Your support is important for the business growth. Appreciate if more can comments and feedback for the restaurant to imporve in near future. Thank you. well,i just visited mokuren this Sunday,this is my 1st time visit.overall is good.price is reasonable,service also good,but there is something can improve.Menu is no picture of food,so it makes me take some times to read it.By the way…is the female boss is Japanese? Must try their seafood salad and tomato salad. Ho chak! mokuren boss now really lansi……. Seriously? Did not return since the first visit though. For various reasons, though none that’s negative. Yes…moruken boss n the wife damn stuck up (lansi) will not go again and never will never recommend any friends to go. first time try and it’s unforgettable. ive ate till very full and its really delicious. 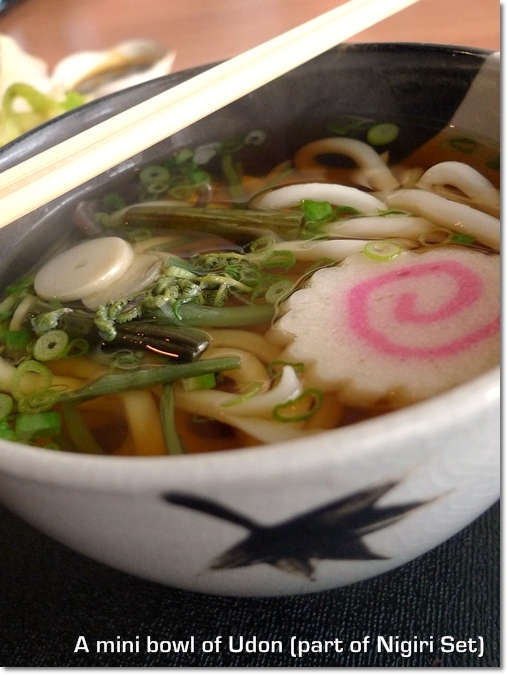 people who love japanese food must come and have a try. its sure worth it. Mokuren is my 1st choice of Japanese restaurant in Ipoh. No doubt the restaurant is small, sometimes you don’t get your seat or served but the food quality is what you cannot complaint off especially the shasimi. The noodles salad is the must order dish in Mokuren. Recommend to reserve your seat before going. Hi, is this restaurant safe for us, the muslims to give it a try? After tried this restaurant i had no interested in other japanese restaurant .. No more zento and akamomiji ..